The Metamorphosis | Reader, I wrote this. ~ Finding universal-ness through literature and what that means for you. Well, and me. The difficulties of waking up as a bug and not caring. Especially when it’s the climax of the story. Or is it? I’m having a bit of trouble getting started. I mean, shucks, this is more or less my first real life post on my first real life blog. So I thought about classic first lines. I didn’t want to do any Pride and Prejudice. Well, let’s revise that statement. I love P&P. I think Jane Austen is a BA satirist from the beyond. Frankly, her and Mark Twain are sitting around at the Famous Dead Author Bar in heaven and having a good laugh over how she’s managed to pull the wool over a great deal of unsuspecting Darcy Fan Clubbers. Regardless of how fabulous the opening sentence of Pride and Prejudice may be, it isn’t the book I need to start with. I mulled for a little bit and decided to whip out an old not-so-crowd-favorite. 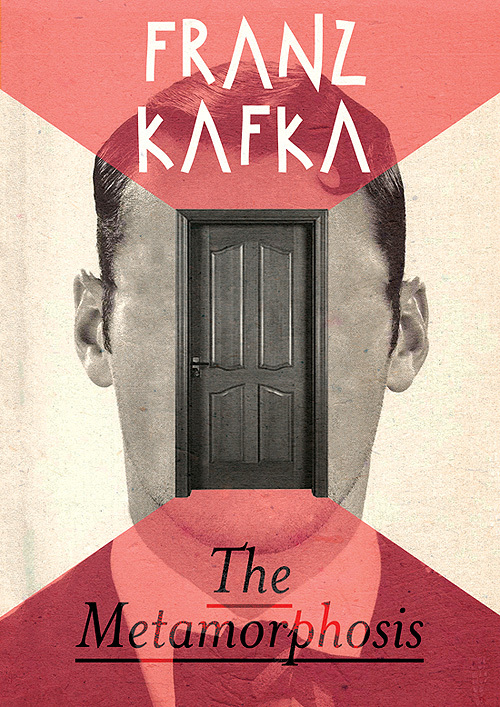 Allow me to introduce my friend, Mr. Franz Kafka’s The Metamorphosis. You wouldn’t believe how hard it was to find cover art without any visual references to entomology. I don’t think that The Metamorphosis is overly hipster-obscure, but because not every school spends two and a half month Huck Finn style to teach Kafka’s twisted novella, I’ll summarize. Gregor Samsa, slave to the system and completely un-actualized, wakes up to find that he was physically turned into a giant beetle thing. He was going for the distorted metaphor thing, what can I say. As Gregor Samsa awoke one morning from uneasy dreams he found himself transformed in his bed into a monstrous vermin. There’s the rub. (<–Hamlet) It’s the climax. Well, sort of. I’m undecided as a matter-of-fact. The reason that it keeps popping up on lists of great first lines is because the major event of the story has already happened. Or did it? We studied this book in English class further towards the beginning of the year, although I had felt ambitious as a sophomore and read it then as well. My teacher, who I’m sure you, dear reader (<–Jane Eyre), will hear all about fairly frequently if this blog takes off, insisted that this was the climax. No questions. Climax, climax, climax. Between my continuous determination to prove this man wrong and the fairly strong conclusions I had made through my own reading, I strongly disputed the point. Allright I got in an actual fight with my teacher. I have strong opinions, ok? My argument was that Kafka used the shock of his first sentence to set a standard for distortion. The idea that his world was terrifically grotesque and that was simply the way this novella ran. No more questions. Now, I honestly don’t know. I honestly don’t have a lot of things figured out, especially regarding literature and even more so regarding the “for real” problems posed by the books I love and respect so dearly. How fair is it, as authors and critics and readers, to put stock into the first sentence. We don’t get to pick first sentences for our life. Technically, it’s “waaahhhh,” which we exclaim upon literally being born, but the maternity ward isn’t really where our human stories start. Even if we are able to pick moments and narratives as representations of us, it isn’t something we tote around. All the same, I couldn’t stand the climax of my life being the first thing people know about me. How do you even choose the climax of your life? I certainly would want to pick myself rather than allowing a depressed, tuberculosis ridden dude from Prague to decide. I wrote about The Metamorphosis first because I’m opening my blog on, if not the climax, an exciting and charged entry. Which is truly what makes Kafka’s first sentence so great. That was his first sentence, and this is my first post. Let’s start on a high note, shall we? I now present to you: Moral Conflict! Don't use WordPress.com? No worries, bro! Just click here.